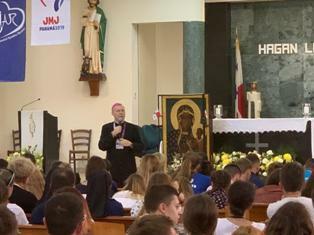 Since the World Youth Day in January, the Icon of the Virgin of Czestochowa is visiting different parishes of the Archdiocese of Panama. In the words of Angel Ruiz Stecco, delegate of Fr. 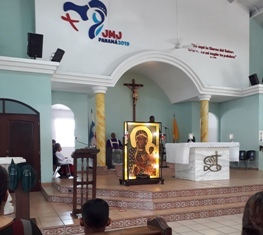 Francisco Verar and of the Archbishop of Panama, Monsignor Jose Domingo Ulloa, Her pilgrimage has been providence, since they have not insisted on making plans, but come to the parishes at special moments. For the Icon of Our Lady of Jasna Gora December 12, marked the beginning of the third week of being in the Church of Carmen. More and more people are attracted to the painful face of the Virgin Mary, a wounded face and a swollen cheek that is almost unknown here. People want to know how the wounds were made and once informed that the original Icon was attacked by Czech Husyts in the fifteenth century, they are amazed at such irreverence. 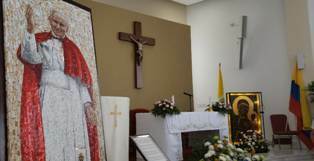 On Wednesday, November 28, the Icon said goodbye to the FETV Catholic television channel at 4:00 p.m. and was transferred to the parish of Nuestra Señora del Carmen, where it will remain for two weeks. That day was a holiday and many Panamanians took advantage of it to travel outside the city, but those who were close to the church listened with great surprise to the ringing of the bells that announced the arrival of the Pilgrim Icon. On Sunday, November 11, the faithful and inhabitants of the San Antonio de Padua Parish of the Citadel Ibarra, participated in a special celebration of the visit of the Icon of the Virgin of Czestochowa in their community. The occasion was an opportune to bless a Grotto dedicated to the Virgin of "El Cisne". 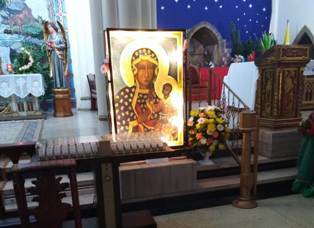 An image of our Lady which the inhabitants of the area have great devotion, faith, respect and love. 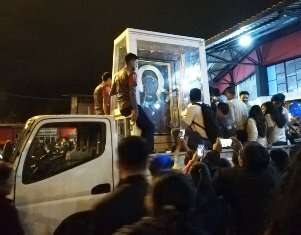 On Monday, October 22, Our Lady the Virgin of Czestochowa visited the Church of Our Lady of the Annunciation, located in the parish of La Mena in the south west of the city of Quito. The reception was given by the parish priest Fr. Denisse Yanangomez, who celebrated the Holy Eucharist and remembers the Holy Father Pope John Paul II.